All India ITR (www.allindiaitr.com) has launched a mobile app for ITR filing. All India ITR is a free app that will help you to file your income tax return anywhere and anytime without any hassle. This All India ITR mobile app is available for Android as well for IOS devices. It is developed by All India ITR, authorized intermediately organization between the taxpayers and the government of India. It is a free app that can be downloaded from Google Play store (Android users) or from iOS App Store (Apple users). In this post, I will share key feature and usage of this app or ITR filing. Easy e-filing – You can file income tax return with the click of a button. This app is suitable for both individual and businesses. This app will guide you through all stage of e-filing. Income Tax Calculator – This app is launched with inbuilt Income Tax Calculator. This income tax calculator will help you to calculate and achieve maximum tax deduction. HRA Exemption Calculator – Salariedpeople can calculate HRA exception from this app. The calculator given here will help you to obtain maximum HRA exemption. You need to provide HRA received from the employer, actual rent paid and metro or non-metro area as an input. Refund Status – If you have already filed your return and you want to know refund status, you can do that by All India ITR Android App. A refund process information can be available after 10 days of filing income tax return. Rent Receipt Generator – Rent receipt submission is mandatory if your rent is above Rs.8333 per month or HRA is above Rs.3000 per month. All India ITR mobile app allows you to generate rent receipt with a click of button. You need to fill up require information and click on Generate button to generate rent receipt. You can print and download rent receipt from this app. 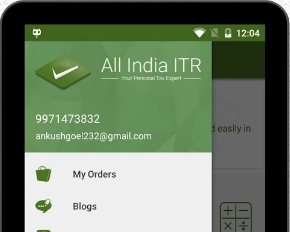 How to use All India ITR Mobile App for ITR Filing? 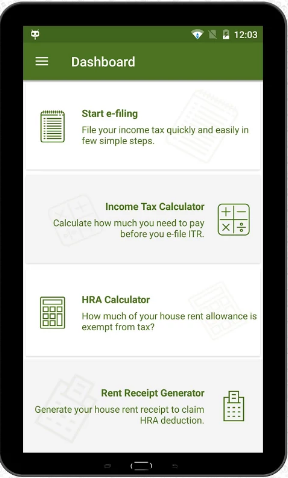 Step -1 – Download and Install All India ITR app from Google Play Store or iTunes. Step -2 – Open ITR app and click on Create New Account (First time user). Give your e-mail ID, mobile number and password to register. Step -3 – It will generate OTP for verification. After verification, your account will be created. Login to All India ITR app with username and password. Step -4 – Click on “Start e-filing” to file your income tax return. You have two option either you can upload Form 16 in pdf or submit documents. The second option of documents comes with cost. E-filing of ITR gets easier. One can file return anytime, anywhere using mobile phone. Form 16 upload facility gives benefit of auto fill ITR without any error. This app saves time and enhances user experience. Rent Receipt generator will help you to generate rent receipt easily. You can also opt for assisted e-filing. Internet access and web browser on mobile devices are required. Difficult to upload form 16 and download rent receipt from mobile phone. I have not used All India ITR app for filing income tax return. If you have used this app for filing income tax return or for calculation of tax, do share your feedback in the comment section given below.